This glossary covers various miniature techniques, supplies, etc - especially things that you can't find in a regular dictionary. I hope this list will simplify things a bit for new small-scale miniaturists, and perhaps provide some new ideas for others. Hopefully, it will also help other non-American miniaturists to identify and locate different craft supplies. As I buy some of my supplies in model railroad shops, I've also included some model builder's supplies that miniaturists might find useful. Please refer to the supply sources page for more information about companies mentioned below. You're welcome to print this page or link to it. If you wish to distribute it by any other means, please contact me first for approval. Nylon lace with a delicate edge. Available in different shades and widths (at least 6 mm to 1.5 cm, or 1/4" to 5/8"). The narrow widths have fewer wavy bands at the top. Available from Sandy's Lace & Trims, Etcetera Etc., and probably also from other suppliers of textile trims for dolls and miniatures. Super thin self-adhesive metal foil intended for detailing model cars and aircraft, but of course equally useful for finishing copper pots etc. Glossier than paint, when applied to a smooth surface. Pale wood with a fine, straight, grain. It's harder than balsa but softer than hardwoods like cherry, making it suitable for building miniature furniture with a minimum of equipment - pieces for 1:48 scale furniture are easily cut with a hobby knife. It comes from North American linden trees. I've met people who presume basswood to be a tropical wood risking extermination, but this is not the case. See Supply sources page for buying info. Constructed like a bottle-brush, hence the name. Basic spruce sold in craft stores and model railroad stores. Tree sizes and package sizes vary a lot (model railroad stores tend to sell really large packages). The color and finish varies. To make them look less brush-like you can cover them with bits of lycopodium (dip one end in glue and push into the bristles), or apply a spray glue and dip in ground foam or model railroad pine needles. Brown Plastic Furniture - sets of basic 1:48 scale furniture, cast in plastic. There are sets for kitchen, bathroom, bedroom, den, and parlour, costing a couple of dollars per room. Most of the furniture is brown, but the bathroom set is of course white (and so are some of the included accessories too). Kitz!, The Quarter Source, and many other dealers carry BPF. Many miniaturists repaint their BPF, or alter it in other ways. A sheet of suggestions for kit-bashing BPF was reprinted in Little Enough News, volume 2, issue 4 (note that some of the BPF has been redesigned, and part of the suggestions apply to the earlier designs only). Turns wood grey or brown. A product by Pat and Noel Thomas , who use it for ageing wood details in their incomparable miniature structures. On their website, they sell it and give hints for its use. Somewhere I saw a reciepe for a liquid that gives similar effects: Put rusty nails in a glass jar, pour on vinegar to cover, put on the lid loosesly and leave it for a few weeks. Open the jar now and then and stir the liquid with a wooden stick, replace lid and let the stick dry completely. If the wood turns a dark brown when dry, the liquid is ready for use and you should remove the nails. Use it as is, or diluted with water, to darken and age wood. Note that the final color doesn't show until dry - always test on a sample first. A word of warning: As the vinegar and rust reacts, a gas is also produced. I read that if you leave the jar with vinegar and nails with tightened lid for an extended period of time (probably months), the pressure of the gas slowly builds up to the point where the jar explodes like a bomb. Prevent this by keeping it somewhere where you see it daily and open it a few times a week to normalize the pressure. Once you remove the nails, the process stops and no more gas is produced, so then you can store it wherever you like. This formula is by no means a recent invention. In his 1912 book More Craftsman Homes, Gustav Stickley writes that floors finished in a soft shade of gray-brown, a permanent color obtained by the use of vinegar and iron rust are suitable for Craftsman interiors. Pipe cleaner that alternates between thick and thin in a wave pattern. Sections of it can be used for making tiny Christmas trees. A 1.5 mm (1/16") thick round knitted cord which can be unravelled into a curly thread, fine for mini fabric trim and mini flowers. Some types of full-scale trim have fringe made from a similar cord, but real bunka works better. Cyanoacrylate glue - excellent for gluing plastic, metal, glass, and fingers. There are thicker and thinner kinds of CA glue and they dry more or less quickly. The thick, slow, ones are called CA+. CA+ glues are gap-filling, i.e. good when the surfaces don't fit exactly. Works fine for gluing hard surfaces to wood, too. I use Zap-A-Gap with the green label, but I'm sure there are many other CA glues that work just as well. A couple of other brand names are Krazy Glue and Super Glue. A chopper is a handy implement for cutting small wood pieces neatly. It uses a single-edged razor blade, so watch your fingers. Works best for thicknesses up to about 1 mm or 1/32". For equally neat back and front, I usually position the wood strip and do only a light cut, then turn it over and cut all the way through. Otherwise you may get a fuzzy edge on the back. This way you can cut slightly thicker wood too (with increasing wood thickness, the blade tends to bend sideways somewhat as it cuts). Balsa can also be cut with a chopper, but then you have to use a quite new blade, otherwise it will squash rather than cut the wood. Now, what's so special about this thing? Well, when using a knife to cut wood strips to length, you have to measure very carefully to get pieces exactly the same length, and it's very easy to get a slightly crooked cut even if you mark out a square line across the strip. Also, if the knife is tilted sideways when cutting, you'll end up with a beveled edge. A chopper simplifies cutting in several ways: The lever-action of the chopper handle gives added force compared to cutting with a knife, the fixture that holds the blade makes sure that the cut is square, and the adjustable guides make it easier to cut pieces of identical length. As choppers are a bit costly, I suggest that you start with a sharp Xacto knife or similar. If you're comfortable with it, fine - you've saved some money that you can spend on your favorite hobby! On the other hand, if you find you're bothered by the phenomena I describe above, consider investing in a chopper. I used just a hobby knife for the first year or so, and thought that it worked OK. Later I invested in a chopper, and now I don't want to do without it. My favorite finish for natural or stained wood surfaces. Seals wood too. Yet another of those why-didn't-I-try-it-at-once products. You brush it on, and wipe off the excess after a few minutes. Use an old toothbrush to remove it from any crevices too - there'll be glossy spots otherwise. Let dry for a few hours, then repeat until you've got the shine you want. You might want to sand lightly with a piece of brown paper between coats. Japanese glass beads that are very regular in shape, they look like little cylinders with thin walls. They come in four sizes, 15/0 (approx. 3/64" or 1.3 mm across), 11/0 (approx. 1/16" or 1.5 mm across), 10/0 (approx. 5/64" or 2 mm across) and 8/0 (approx. 1/8" or 3 mm across). All sizes come in a hexagonal cut as well as round. A mix of brown and black paint, heavily diluted. Used for ageing new-looking surfaces. I used it on my castle to tone down the colors of the stonework. Do It Yourself. Often seen in phrases like DIY supplies, DIY projects, DIY instructions, etc. To dry brush, you take a little paint on a stiff brush, brush it against a sheet of paper to remove nearly all of the paint, and then brush lightly over the surface of an item to create faint highlights on protruding details. For hightlights, a lighter shade than the main color should work best. Sometimes used over a dark wash for added depth - see wash.
Dremel make small hand-held power tools. The name Dremel is more or less synonymous with a small multi-purpose power tool for drilling, sanding, etc. To assemble something temporarily without glueing, to check that everything fits together. Masking tape is indispensible when you want to dry fit anything that has more parts than you have hands. I'm especially fond of 6 mm (1/4") wide masking tape, as it can be used for furniture too (and for 1:144 scale structures). Some quilt shops carry it. Eyelash braid or eyelash picot is about 3 mm (1/8") wide including the eyelashes, which are loops, not cut fringe. It is available in about a dozen different colors from most suppliers of miniature textile trims. Some suppliers also carry a 4.5 mm (3/16") wide version that has eyelashes along both edges. Eyelash braid is often used for decorating dollshouse dolls' clothes and curtains in 1:12 scale. Short, fine, textile fibres, used for giving items a velvety surface. It is frequently used on e.g. jewellery boxes. Here's one way of applying flocking: Put flocking in a plastic container, shake to add a static charge so the fibers stick to all the walls. Paint item in the desired color, drop in flocking, shake, remove furry ball, let dry, shake in empty container to remove loose flocking. Floral or florist wire is flexible steel wire that is either covered with paper or wrapped with thread, or just coated with paint. Usually green or white. Florists frequently use it in flowers arrangements. Sometimes it is called cake wire, as it is also used for securing flower arrangements to fancy wedding cakes. Millinery wire is similar to floral wire but it seems to be much thicker. Miniature uses for floral wire include wicker furniture made by weaving heavy thread around pieces of florist wire, flower stems, and armatures for trees. The wire covered with paper or thread isn't that easy to obtain, but it's very good for mini wicker, as it can be stained. Two sheet of card with a layer of plastic foam between. "Designed for graphic arts display and mounting applications requiring fairly rigid, lightweight material." Sturdy, but the edges may be hard to glue due to the foam. Will warp if one side only is painted. Ask for it in art supply stores. Apply to cut edges of fabric to prevent ravelling. In miniature, it's almost impossible to apply a thin enough line with the original bottle, so try transfering some of the liquid to an empty nail polish bottle. The applicator brush gives much better control. FrayCheck will stiffen, and in some cases darken, the fabric a little. FrayCheck seems to age a bit over time, getting partly white (especially visible at the bottom of the bottle). Some people finish needlepoint rugs by coating a few of the outer rows of stitches with FrayCheck and cutting out when dry, and of course this spells disaster if the FrayCheck leaves a whitish deposit on the surface. Always try on a colored fabric scrap first! FrayStop is an alternative to FrayCheck. I have no first-hand experience of FrayStop myself, but I understand it's similar to FrayCheck except that it isn't solvent-based, so it smells less. Both are intended for use on full-scale textile items and are completely water-proof - they will stand up to machine washing. Paper that is coated with wax or plastic on one side (used for wrapping foods for freezing). For printing on fabric, you can iron freezer paper onto the back of your chosen fabric, trim all edges and use in your printer. Some freezer-type papers have a coating that is too thin for ironing it onto fabric, but these still work well to cover your gluing surface - no more mini projects inadvertedly stuck to the table! If you have problems finding freezer paper where you live, try quilt shops. Similar to Foamcore, but I understand the sheets enclosing the foam are plastic too, preventing it from warping. Acrylic paint that artists use to prepare their canvases. It's a flat white, and has very good covering power. Good for sealing e.g. miniature walls before painting, as it hides any color variations. Sand when dry for a smoother surface. That's ground as in grind; not ground as in soil. Colored soft plastic foam ground into small pieces or fine powder. Used for imitating grass, other greenery, and flowers, in small scales. It is sold in model railroad shops, often in rather large bags as railroad layouts are fairly large. Miniaturist suppliers of small scale landscaping supplies may carry smaller bags. A type of cardboard. Cold press medium weight illustration board is sometimes used in miniature structures. It's almost 1/16" thick. Very thin card - it's slightly thinner than a regular business card. To adapt a kit, or alter a bought miniature, making substantial changes according to one's own ideas and preferences. Originally this seems to be a model builder's word for combining parts from different kits to build a model. Build a corner from Lego bricks and use for an assembly jig. I know some miniaturists suggest using the inside of a square box instead, but then you actually can't be sure that all angles are square. When making molds for casting hard plastic items, the manufacturer always has to make sure that the item can be removed from the mold easily without braking. This is acheived by making sides of an appearantly square box slope slightly, so e.g. the interior of the box is slightly wider at the opening than in the bottom. In some cases the slant is noticeable. As Lego bricks are made to fit together perfectly, all corners are quite square, making them perfect for jigs. Little Enough News - a newsletter specializing in quarter scale (and occasionally smaller) miniatures. No longer published, but publisher Pam Scott is still selling back issues. Please see the info and links on my Little Enough News page. Also called Princess Pine or Erica moss. A natural material with small "pine needles". Looks like 1:12 scale pine, e.g. in Christmas decorations. I've used it in my 1:48 scale Christmas trees, and it can also be used to simulate other plants. The material used for making a passepartout (the white area around a framed picture). Short for Mary Engelbreit (an American artist/designer) and her signature style. Metal paint that you buff when it has dried for a while. This results in a more or less lifelike metal look. I bought the steel colored Humbrol Metal Cote to try it, and it looks really great. Some people refer to 1:144 scale miniatures as microminiatures. Oil-based stain in a marker-type pen, produced by Minwax. Intended for touching up scratches in stained furniture, but is also very convenient for staining miniature projects. Dries quickly, but is smelly. Matchbox Models of Yesteryear is a series of model cars, produced since 1957. Like the original Matchbox toys, they're not all made in the same scale. Instead, each of them is sized to fit in the same box. The MOY cars (and boxes) are noticeably bigger than the original Matchbox ones. The scale of each car is stated somewhere on its box. Though 1:48 scale is of course preferable for a 1:48 setting, you can go a little larger and a little smaller - I usually look for 1:47 to 1:49 scale, as a scale difference of approximately 2 % is too small to be spotted. If you have to deviate more, I'd suggest you go for smaller scales (1:50 and on) rather than larger, as a slightly too small car seems to look better than an oversized one. For a little more information on scale - see O scale. The brand name of a thin polyester film, which is produced both in transparent, opaque, and a metal finish (look inside a bag of potato chips!). When mylar is mentioned in mini projects, it usually means thin mirror-look material that can be cut with scissors. I buy my favorite mirror material at an art supply & home decorating shop. It's self-adhesive, has a protective film on front, and was sold by the yard. The dealer said it was popular for creating mirrors on board small boats, so it's sufficiently mirror-like even for full-scale use. When you've removed the backing and protective film, the actual mirror material is only 0.25 mm (.01") thick. National Association of Miniature Enthusiasts, read more about them on their website. NAME publishes The Miniature Gazette, containing both NAMe news and information, and miniature projects. Small files suitable for miniature work. Tiny glass balls in different colors (clear, transluscents, opaques and metallics), used for knobs, castors, and lots of other round objects in miniature. They're sold in a few different sizes, ranging from about ½ mm to 1.5 mm (from under 1/32" to 1/16"). Look for them among miniature supplies and card-making supplies. As a last resort, substitute poppy seeds or brown mustard seeds. No-hole beads seem to get their color from a coat of paint, they're not colored all the way through. When repainted a light color, the original color might bleed. O (or 0) scale is the model railroad equivalent of 1:48 or 1/4" scale in the US, so American O scale cars are great for 1:48 scale scenes. There are many American suppliers of O scale cars. Warning: Note that in Europe, O scale seems to mean 1:43 scale rather than a true 1:48. Though the difference may seem small, this means that e.g. 1:43 scale model cars (which are widely available in Europe) in a 1:48 scale setting would be nearly 12 % too large. If there's a doll anywhere near the car, the discrepancy is quite noticeable. Sad, but true. I know this from experience - I bought a cute 1:43 scale VW bug that I just couldn't resist, and when I place it next to a 1:48 scale female doll, it stretches above her head. A VW bug is certainly not that tall in real life! Brand name of an air-drying clay (Das is another brand). It's lightweight, and almost white when dry. Good for creating textured surfaces, like stone walls etc. (Though Paperclay can be used for other modelling uses too, it is a bit tricky to use for tiny details, as very small pieces tend to dry quickly.) Rik Pierce of Frogmorton Studios wrote a very good how-to article in Miniature Collector (May 2000), describing how to texture and paint Paperclay to create brick, rock and stone finishes. Two extremely thin layers of wood laminated together (like plywood, except both layers have their grain in the same direction). The resulting material is about 0.5 mm or 1/64" thick. It is intended for cardmaking and similar crafts, and you can also order it from the manufacturer. When project directions call for PaperWood, you can usually substitute any other wood shaved down to a similar thickness (though that is easier said than done). Fimo, Cernit, Sculpey, and other brands of modelling compound that can be hardend by boiling in water or baking in a household oven. Great for making mini foods and mini dolls. British artisan Angie Scarr makes terrific 1:12 scale food using different caning techniques, many of which can be adapted for 1:48 scale use. Pleating device by d. Anne Ruff. See her website for more information. The smallest size pleater, Pretty Pleat Tiny, is used for 1:48 scale. It is available from d. Anne Ruff as well as from The Quarter Source, Sandy's Lace & Trims, and others. Printies is a shorter word for printables - miniature objects and mini-supplies produced using your computer printer, e.g. rugs, paintings, book and magazine covers, wallpapers, paper models of furniture and appliances and much more. There are many pics on the internet that can be rescaled and used this way, and if you have a scanner you can draw from your books and magazines too. Look for good head-on photographs. Many mini sites feature printies, Jim's Printable Minis is the largest and most well-known. White wood glue. When a project calls for diluted Tacky glue, I usually use diluted PVA glue instead (it's easier to dilute as it's more runny from the start). PVA glue dries hard while Tacky glue dries a bit flexible. Pre-cut narrow strips of heavy paper (available in different widths). The strips are coiled more or less loosely around a heavy pin, and the coils are then shaped and arranged to create a kind of three-dimensional paper filigree designs, known as quilling. Small-scale miniaturists sometimes use quilling paper strips instead of thin wood strips for baseboards, door frames, etc. This one confused me a lot! My dictionary told me that resin is the sticky substance you get from fir tree trunks, but it didn't mention that there are also synthetic resins, used for casting e.g. miniatures or other decorative items. It's a kind of hard plastic. You can buy resin to cast things yourself using a mold. A resin kit contains bottles of two different liquids. Carefully mix the liquids in correct proportions, pour the mix in the mold at once and it starts to harden after a short while, emitting nasty and unhealthy smells. Thin wood strips (up to about 3 mm or 1/8" square), available in model railroad shops. Sizes are usually given as HO scale inches, but the size in N scale inches may also be given on the pack - if in doubt, ask the dealer. HO 4"×4" wood is exactly 3/64" square, a nice size for table legs etc. A pack of scale lumber typically contains a dozen or more 11" strips of the same dimension. The Quarter Source carries scale lumber, and sells it in smaller quantities than the regular packs. Note that this catalog gives the dimensions in 1:48 scale (O scale) rather than HO scale. If you're looking for a specific size of HO wood you just have to halve the numbers to get the dimensions in 1:48 scale inches. Strip wood and sheet wood form the basis of my wood supply, and scale lumber is a nice addition. I mainly use it for creating panelling by gluing thin strips (one HO scale inch thick) onto a piece of wood. You can see this e.g. on the base of the Victorian bookcase and on some of the Tudor furniture in my castle (chest, box chair, cradle, and clothes press). I also use the 2 HO scale inch thickness, for making baseboards. It's about 0.6 mm thick (slightly thinner than 1/32"), so I think it is more in scale. A model builders' term (I think), meaning that you've built an item from generic supplies like stripwood, dowels, wire, plastic strips, whatever... as opposed to a kit of specially made parts. Wood cut to a specified thickness, and typically 5 to10 cm (2" to 4") wide. I've seen sheet wood thicknesses of 1/32" (1 mm) and up. I use it when I need wider parts than I can get from strip wood. In theory, you can use sheet wood cut to different widths instead of buying strip wood. But then you'll end up spending a lot of your mini time on cutting and sanding the strips, so I don't recommend it. I did that in the beginning, when I only had veneer to use (no sheet wood nor strip wood). Now I use strip wood whenever I can, and it saves me lots and lots of time. A cream colored or black foundation for fine needlepoint, with more holes per inch than regular needlepoint canvas has. It's available from Bobbie Schoonmaker (at a good price! ), Sandy's Lace & Trims, and other suppliers of fine needlepoint fabrics. Be aware that prices vary a lot (say $0.12 to $0.70 per square inch) so shopping around may pay off. Check out my page on silk gauze for needle and thread suggestions. Yes, I know it sounds like alchemy, but it's not! This clay is made from silver powder mixed with a substance that acts like a glue. When fired in a kiln at 800°C or 1600 F, the glue substance burns off and the grains of silver fuse together, leaving a object of almost pure silver. As the glue part of the clay burns and only the silver is left, the items will shrink a bit (seems to be 10-20 % depending on brand of clay). After firing the items are covered with white oxide all over and have to be polished with a wire brush to bring out the silver color. Silver clay is mainly used for making custom silver jewelry, but makes nice miniatures too. Silver clay can be shaped similar to polymer clay but is less elastic. It looks grey from the start but whitens as it dries in the air. If you scrape lightly with a knife on dried clay, the silver shows. You can roll it out flat, shape it with your fingers, impress with findings, push into a mold, or shape in any other way you like. Pieces can be "glued" together with watered-down clay. You can make nice silver bowls, vases, etc, by making a mold (from paper clay or moldable cork) that you brush repeatedly with watered-down clay to build up a layer of silver clay around it. The mold will burn in the kiln and leave just the silver object. I guess wood turnings can be used for molds too. For hints on making small-scale miniatures from it, go to my silver clay miniatures DIY page. Wood strips of specified width and thickness, cut to imperial or metric dimensions. Project directions for 1:48 scale miniatures typically use the 1/32" thickness in lots of different widths (for baseboards, drawers, shelves, table tops, doors, etc), plus square strips for legs and posts. A popular happening in mini online groups. Basically a way of exchanging mini items with other miniaturists. A swap may have a special theme, like "Victorian" or "Flowers", and a minimum value. You sign up with the swap organizer, who then distributes a list of addresses to all participants. You're supposed to send finished mini items (made or bought), unless it's a swap for printies, supplies, etc. THE glue for miniaturists. Easy to use, tacky enough to keep most small pieces in place at once, without having to clamp. The joint is slightly flexible even when dry. Works best for surfaces that are a bit absorbant - it doesn't work as well on glass and metal as on wood and fabric. See CA glue and PVA glue for more information on glue. Used for securing mini items in a setting, if you don't want to glue them in place. Can be removed from hard surfaces without leaving traces. Turned wood sticks in a few different designs. The ones shown have maximum diameters of 1/8", 5/32", and 3/16", respectively (3, 4, and 5 mm). Used for building furniture in 1:12 and 1:24 scale. In 1:48, they can be used for pedestals, vases, etc. Kitz! carries them. Round toothpicks of standard thickness (2 mm). One end is pointed, the other is turned. Make nice table legs, bed posts, etc - especially if you take the time to enhance the shape a bit with files and sand paper. So far, I've seen them in craft shops and Oriental food stores, but supermarkets might carry them. Kitz! carries them too. Knives that have a longish blade contained within the handle; you snap off a section of the blade to get a fresh sharp point. A wash is heavily diluted paint used for achieving different visual effects. When applied to an item that has nooks and crannies, it tends to gather in these, creating depth (a darker shade than the main color is best then). Then highlights can be brought out by dry brushing - see dry brush. Other uses for a wash include toning down the color of a surface - see dirty wash.
Lightweight fusible material for bonding two fabric layers to each other. Used in fabric crafts and applique. Also available as a fusible tape for hemming pants. Assortments of small precut wood shapes in different sizes, sold by the bag. There are squares, triangles, circles etc. Popular brand of scalpel type hobby knives. A cylindrical handle with a replaceable blade. 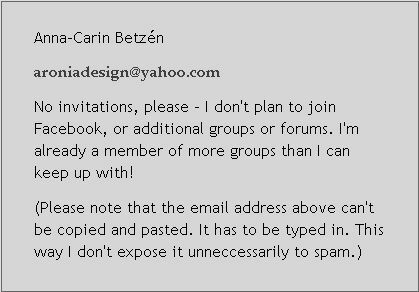 © Copyright Anna-Carin Betzén 2003, 2004, 2005.